Gazebos are stylish and regal structures which have graced high class lawns and gardens for centuries. These days homeowners can afford garden gazebos themselves, and so they are becoming a more common sight. With mass produced gazebo kits and even portable gazebos, you can often find a solution for less than a hundred dollars. Though the old adage that you get what you pay for is always an important consideration. In some cases this widespread nature of prefabricated gazebos can undermine the sophisticated look that they are known for. A the same time it also opens up a great deal of room to make your gazebo and landscaping into a unique and functional combination. There is a tremendous variation in the styles, materials used, and price range for gazebos these days, and so there should be an option that is right for every yard and every budget. In general there are two types of prefabricated gazebos that you can buy. Portable and lightweight gazebos that function much like camping tents, and more sturdy kits that you assemble on site. Each has a specific purpose they can fulfill. Understanding how they fill these purposes will ensure that you can choose the right gazebo for your garden. In a garden, a gazebo can do a lot for an outdoor structure. The style of the gazebo can of course be a wonderful aesthetic addition to the garden. Not just in it’s own right, but in how it interacts with the more natural aspects. Wooden gazebos are especially adapt in this regard, as the natural look and feel of the construction materials will feel right at home among the rocks, bushes, and trees which decorate the landscaping. A gazebo can also serve as a foundation upon which to build that landscaping. For instance, much like the potting shed, a gazebo can have built in planters and places to hang pots from, creating a great area to grow plants which could use a little bit of protection from the elements. At the same time, these plants can help give the gazebo an even more natural appeal. In some cases, an arbor integrated into the gazebo can even make for a privacy screen, and increased shading in the hot summer months. This is an especially useful addition to the south facing side of a gazebo if there isn’t adequate shade from trees. Most gazebo kits are heavier and have wooden structures with a conventional wood slat roof. This allows for the gazebo to be used year round, whether snow or shine. The roof is sturdy enough to stand up to snow accumulation, and during the summer the shade is complete to provide a very cool place to enjoy the beauty of your garden from. Since the framing of hardtop gazebos is generally heavy duty, you can use it to support heavier objects. This could mean hanging pots from the rafters or eaves, or even stringing a hammock between two of the posts. With a hardtop gazebo in your garden, you will have a comfortable place to rest and relax and soak in the beauty of nature. There are some problems with hardtop gazebos though, especially in gardens. Often these roofs aren’t as high quality as you’d expect, and can have problems with water damage within just a couple of years. Using the gazebo as a trellis can increase the likelihood of water damage occurring, due to the plant canopy increasing the humidity the roof and structural components face. Another problem is that often the roof isn’t as high quality as you’d expect. Wood slats bring a picturesque look, but they have to be made of the right wood to resist water and pest problems. Also, regardless of the wood used, you will need to maintain the finish so as to keep it well protected from the elements. In cheaper kits though, poor choice of wood for the slats is a common problem. Even with reapplying protective sealants, wood like pine can have problems with water damage, dry rot, or termites within just a couple of years. Wood such as cedar, redwood, and teak are far better suited for such applications. So choose your kit carefully. Gazebo kits aren’t too difficult to set up, but for those who just want a gazebo now without much effort, canopy versions are available. While some of these are still rather heavy duty in regards to their framing, there is a whole range between that and the instant pop up gazebos that are also available. In between you will find lightweight gazebo canopies, often with aluminum framing, which can be moved around without much effort. This can be a real benefit in a garden. When plants are first sprouting, they need protection from the hot sun and heavy rains. With a fabric cover like canvas, you won’t get total shade. In fact, you can choose just about any amount of shade you want by choosing the right gazebo canopy. Canvas, depending on what weight of material it is, is somewhere in the middle ground, with lighter fabrics allowing more sunlight through. 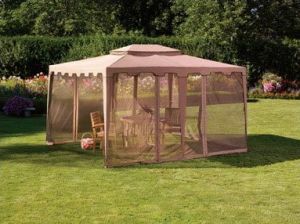 So having a lightweight gazebo canopy can give you a rain shelter and screen house for your new plants. The problem with gazebo canopies is that they aren’t able to stand up to heavy weather, especially snow accumulation. This means that you can’t leave them out all year in colder climates. Heavy winds can also damage them, leading to tears in the stitching or even bent framing poles. Also, the structures aren’t very hefty in most cases, so can’t hold up a lot of extra weight. You may be able to get away with hanging a planter or two from the frames, but a hammock is out of the question. You can get around these drawbacks by using stands for planters, or even for hammocks. In fact you may find that a standalone hammock frame is the perfect accessory to a lightweight garden gazebo. That way you can have a shaded spot to enjoy your hammock when it’s too hot outside. At the same time, you always have the option to remove the canopy and enjoy the extra sun while taking a nap during the cooler times of year. Most prefabricated gazebos have accessories that you can add to them. This can be lighting or curtains, privacy screens or insect nets. For the garden, the insect netting offers an interesting possibility, especially for gazebos with very lightweight cloth canopies. In this case you can create a simple greenhouse that doesn’t cost much money. It can be a wonderful place to grow light-sensitive plants and seedlings.